"Here I am back in Africa. I remember clearly my first steps on this mysterious continent. I will no doubt need all the experience gained during my first outing, as nothing comes easy in Africa. 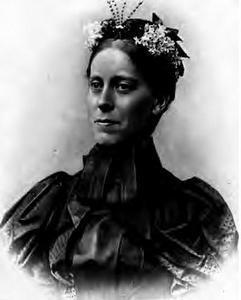 I am also somewhat short of funds, for exploration is an expensive business..."
Mary Kingsley is back in Africa. After spending two months in Luanda she is headed to the village of Maskouii with the intention of trading trinkets for antique masks. The masks can then be sold to a wealthy collector and the funds used to help her expedition to Mount Cameroon - The Throne of Thunder. 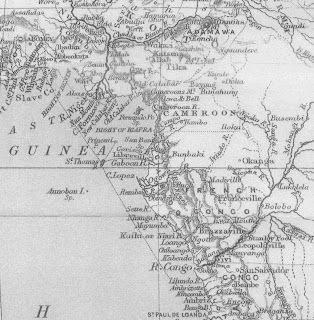 Mary also hopes to improve her knowledge of Africa by entering into contact with the natives and making new discoveries. 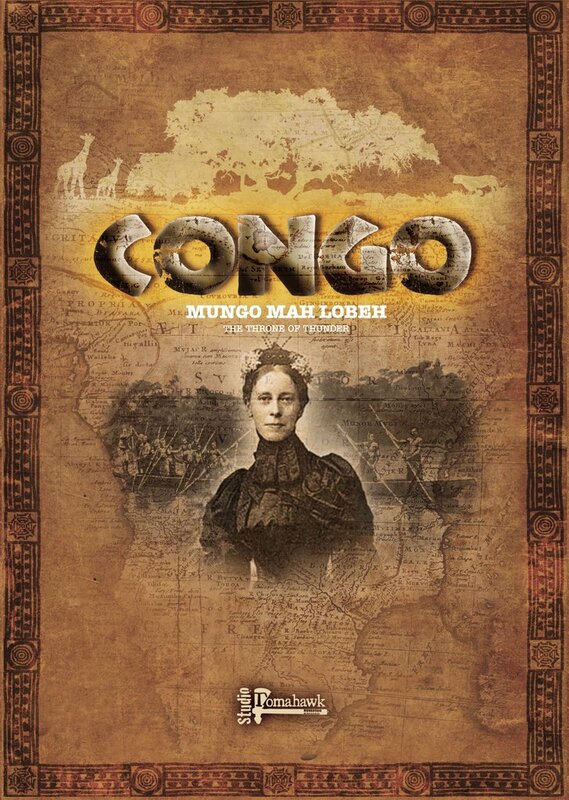 Mary is accompanied on her first adventure by her Kirangozi, Kiva and an old acquaintance she met at Luanda, a famous botanist called Bergamote. Her party includes Soldiers, Adventurers, Trained Askaris and a group of local Askaris who agreed to come along to Maskouii, but will go no further. Currently she has only a single Bearer, but hopes to hire more men on her journey. For some time Mary has felt uneasy as though an unseen shadow was watching. As she travelled to Maskouii that shadow revealed itself as the Fang witchdoctor Ujuwa. Ujuwa is determined to put a stop to the growing menace of white foreigners by completing a powerful ritual to awaken the spirits that sleep below Mungo Mah Lobeh. In this endeavour he is accompanied by a local chieftain called M'Otowanfa and a small war party consisting of Warriors, Pygmy Warriors, Hunters, Archers and Bundukis. Two Sacred Warriors accompany Ujuwa to help him with his ceremonies. Ujuwa sends his war party forwards and his Pygmy Warriors head to the west whilst his warriors make for the village. If Ujuwa can take possession of the masks first, perhaps this strange Victorian woman will leave his land and return home. Mary of course is having none of it and upon seeing Ujuwa in the distance she quickly darts into a patch of bush and stumbles upon an old pot. But a shout comes from the men back at camp, wild animals have turned her camp upside down and her supplies are in disarray! Confused, Mary looks into the earthenware pot hoping to make a new discovery but instead finds it is cursed!! One of her soldiers loses his nerves and before Mary can stop him, he flees into the distance. ... and his Pygmies run towards another patch of bush containing a large pot. Seeing the witchdoctor's warriors in the village, Mary shouts towards her Ruga Ruga who try to enter the village but are struck down with fear and panic. Ujuwa's Pygmies carefully enter the acacia copse where they are assailed by another tribal chieftain who accuses them of selling him faulty goods. Bemused, the Pygmies assure him of their good intentions and the chieftain goes on his way, mumbling about muskets with flames coming from the wrong end... The Pygmies then smash open the clay jar - and find it full of snakes! Luckily their fast reactions save them from being bitten. Mary's Trained Askaris venture into another acacia copse where they become unsettled by the gloom. Ujuwa spies them and starts to chant the Ritual of the Wild Hunt. Success! Suddenly the Trained Askaris are attacked by giant ants!! Screaming in agony, one of the hapless askaris is engulfed in a living ball of insects and before anyone can help him he is dragged down a hole in the ground. Seeing her Ruga Ruga cowering, Mary leads by example and marches into the village - albeit accompanied by a rifle armed group of Soldiers. Incensed by this intrusion, Ujuwa's Warriors brandish their spears and charge! The Soldiers are beaten back. Mary pleads with the Warriors and offer them glass beads to prevent them killing her soldiers. Ujuwa spots Mary's antique buyer lurking by a clump of acacia and shouts to his Warriors. Seeing the threat, the Trained Askari (having rid themselves of their six legged foe), block the exit. But the Warriors feel confident and with spears banging against shield they charge. Ujuwa's Warriors fail to make any impact on the askaris who beat the Warriors back with their muskets. Two of the Warriors are killed and the rest fall back, leaving behind their precious mask. Not quite believing their luck the Trained Askaris grab the mask and leg it! By now the sun was reaching its zenith and the savannah was becoming hot. Too hot for one of the villagers who retires into their hut taking their mask with them. Only one mask remains. Mary heads back into the village and after some firm (but fair) negotiations is in possession of the last mask. With snake skins hanging from their belts, the Pygmies quickly take up position and hurl their spears at the Soldiers. Before they can form a shooting line, the Soldiers are overcome by the Pygmy Warriors leaving only Mary and her Bearer alive. They quickly fall back - but are forced to leave behind their mask. Ruga Ruga open fire with their muskets. A deafening sound rings out over the savannah. When the Pygmies open their eyes they see that the only effect was a large plume of smoke enveloping the shooters. Suddenly, the Ruga Ruga find themselves charged in the flank by Ujuwa's Warriors baying for blood for the loss of their mask. The Ruga Ruga are cut down and the three survivors flee for their lives. But Ujuwa sends in his Hunters who pepper the Ruga Ruga with arrows. Only one man remains standing. Ujuwa sent his Hunters after her, but they became entangled in an acacia copse and Mary was able to escape. Mary managed to escape the village with a single discovery that turned out to be a new species of violet. More importantly she managed to sell one of her masks and this won her the game 10 vp to 8 vp. But during this adventure Mary was forced to use up two of her precious barter points leaving only one for the next game. Travelling to her next adventure will take Mary four months as she travels through the jungle, meaning she has now been in Africa for a total of 6 months. If her expedition is to be a success she must try to be quicker. Still, the medicinal plants she found in the jungle may yet prove useful. Since both parties had one mask each, no additional Knowledge was obtained. But Mary's points for Journey Length will decrease as time goes on. The player with the highest number of AP at the end of the last adventure will win the overall campaign. Our Throne of Thunder campaign for Congo starts tomorrow! Whilst it's been quiet on the blog front for a while now, I've been beavering away in the background getting a new Forest Tribe column and various bits and pieces of terrain assembled and painted for Congo. 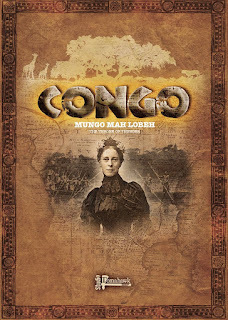 Mungo Mah Lobeh is a six scenario campaign based around Mary Kingsley's expedition to find a new route to the summit of Mount Cameroon (Mungo Mah Lobeh or Throne of Thunder of the title). To do this she will need to gain knowledge of Africa and its peoples, make new discoveries and travel through difficult terrain that includes savannah, swamp and jungle. All the while shadowed by a mysterious Fang witchdoctor called Ujuwa. I aim to write up each of the adventures and give an overview of the campaign supplement along the way. 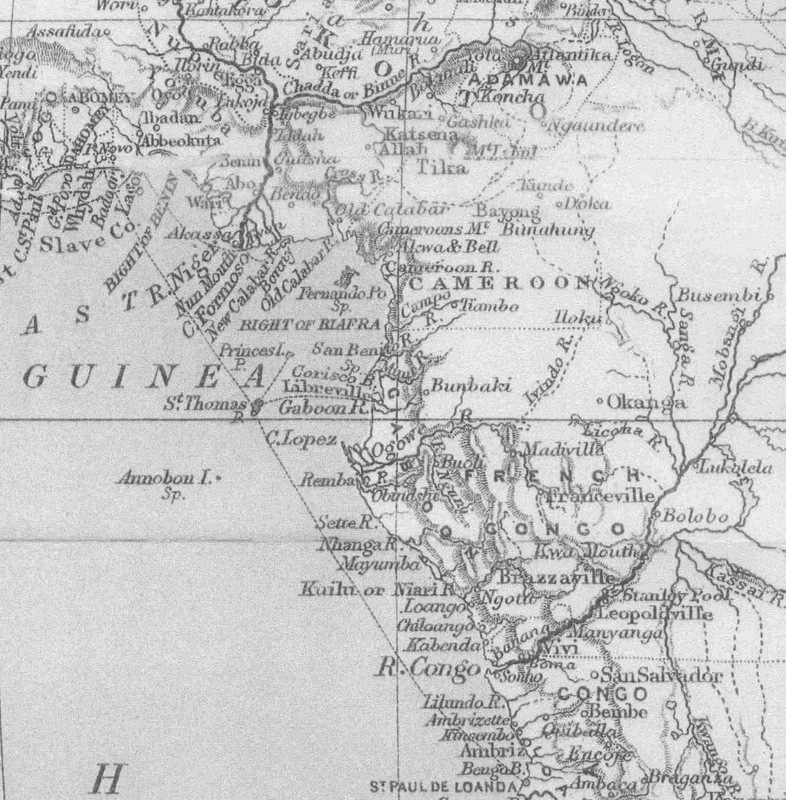 For now rest assured that Mary is travelling safely on the steamer Batanga and will soon be making port at Luanda on the west coast of the Dark Continent.